The parson was in a meeting. It was a good meeting. There were no arguments, no posturing. The pastors and laity gathered around the tables were reviewing some significant accomplishments in an area cooperative ministry and were previewing more ministry to come. The parson took an inventory of the little more than half dozen pastors there. They ranged in age from the early thirties to one who was only a decade below the parson. They were a mixture of race and gender. The parson studied the faces of each ordained participant. The lines on their face etched a picture of their ministries. One, that one just below the parson's longevity, had many creases on his face. Some spiraled out from the edge of his eyes as though hinting of a lifetime of laughter and amusement, and speaking of one who'd found his place in the scheme of things and found joy being where he was. The brow of another was wrinkled. She'd been assigned a difficult church. The parson knew her church well. And he knew her well. He'd never been sure if her having been sent to that particular congregation was a slap at the congregation from a supervisor who knew they'd bristle at a female pastor or a slap at her for being the determined pastor she was. Directly across the table from the parson one pastor, new to the area and new to this group, sat with eyebrows puckered as though trying to come to grips with the magnitude of the ministries being talked about and the constant reminders of the other pastors his congregation needed to become more supportive of the work. A particular pastor, at the end of the table, almost apart from the group, appeared to have no lines of distinction on her face. She sat doodling on her pad seemingly oblivious to the flow of talk unless asked a direct question. Having surveyed the folks the parson smiled as he wondered what the many wrinkles on his face might say. And then he looked to his left and studied once again the face of a middle aged pastor who was serving a fairly wealthy but inward focused congregation, but who day after day after day after day and sermon after sermon after sermon after sermon and meeting after meeting after meeting after meeting, year after year after year, reminded the congregation that God was calling them to something higher, something more fulfilling, something more redemptive. And all that he did with such a love that none of the members he pestered and chastised would have a thought of asking for another pastor. The parson spoke a silent prayer that he might wear the lines on his face with such distinction and heavenly grace. 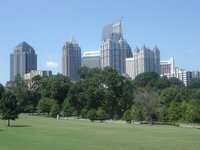 The park was located in the inner city, within a neighborhood that had been desired in the 1930s, 40s, and 59s, seen decline in the 60s and 70s, a resurgence in the 80s and become a center of individual involvement in the life of the neighborhood, a beehive of activity for betterment of people of all social status. The neighborhood was proud of its park, and though it belonged to the city it was the people of the neighborhood who kept is pristine. A grove of ancient hardwoods formed the eastern border of the park. The stately oaks stretched their limbs to form a canopy over the concrete path that meandered through the trees, leading the walker along the edge of the state-of-the-art playground and ending at the opposite street bordering the sixth hole of the nine hole golf course. It was on that concrete path the parson found himself one day in early fall. The leaves were still on the limbs, the weather was still shirt sleeve, but the wind held the promise of chilly weather a'comin. As the parson walked along, occasionally picking up an acorn or two to toss toward a tree here or there, he suddenly heard, coming from the depth of the massive oaks, the lyrical sound of a guitar. He stopped. He listened. Again, he heard the sound. The plaintive sounds of the vibrating strings hitched a ride upon the softly moving winds to reverberate upon the parson's ear. Like the sirens calling an ancient Greek on his own quest, the parson was drawn amid the trunks and shrubs onto a path barely wide enough to provide a way for the critters of the park. He paused at the top of the rise on which he stood and looked down into a depression where in inclement weather the storm drain brought a torrent of water. There, beside what on cool nights served as a campfire, sat a man upon the trunk of a fallen tree. His age was indeterminate. His back was turned from the parson. His head decorations of ribbon tipped dreadlocks seemed to dance with the rhythm of his coming from the guitar resting on his left thigh. Each note of Amazing Grace seemed wrapped within the melody brought forth from dexterous fingers in constant movement, each sounding a note in counterpoint to the former. The parson paused in his silent mouthing of the words as his accompanist veered into an improvised jazz-like detour from the melody. Silently the parson listened with closed eyes until the strumming fingers beckoned him back to the melodic tale. A movement caught the parson's eye. The blue uniform stood out as the man stood at the top of the hill where the concrete initiated its meandering path. The parson knew the man. The parson knew why the man was here. The parson rose and quickly walked to the top of the rise. “Well, you're going the wrong direction,” said Henry, his right hand resting on his 9mm. “No, we don't,” said Henry. Henry reached for the radio on his shoulder and summoned his partner. As they waited the conversation turned to Henry's family. Finally, his partner came. “Luck of the draw,” said the young policeman. The three walked over to the church where the parson gave them a handful of tickets to the upcoming event. “You're most welcome,” said the parson. Henry and Robert turned and walked up the street toward their patrol car. “Thought you were going to sweep the park?” the parson said. The parson was turned off the highway onto the entrance ramp of the interstate. He was walking down the ramp slowly, obviously waiting for a ride. The parson took him in. Neatly dressed, a crease was visible in his jeans, the shirt ironed and spotless. He carried a backpack in his left hand. The parson pulled over. “You need a ride,” the parson asked out the right side window he'd lowered. “I'm on my way to Orlando,” he said. “I'd appreciate that,” said the traveler. He moved to open the door. That's when he saw the parson's faithful canine companion, who'd just sat up to check out who was opening the door, in the back seat. The parson pulled the lever beside his seat. The trunk opened. The young man stored his pack, closed the trunk and hopped in the car. “Thank you very much for this,” he said as soon as his seat belt was fastened. “No problem,” the parson replied. “That's refreshing to hear,” said the parson. The rode south as the parson learned more about his new acquaintance. He was pretty much on his own. His parents had been killed in an accident the summer before he entered college. His scholarship was playing soccer. The college he attended was a small religious affiliated school. The dean of the college had promised him he would be readmitted when and if he returned. “You hungry?” asked the parson as he exited the interstate where he was going to have to head in a different direction. The parson and the young man headed inside. The parson found a table vacant next to a window that overlooked a slope that led down to a modern truck stop a hundred feet away. “What about you, young man?” Betty asked. “I'll have the same,” he said. He asked the parson about the area after Betty had gone. This was a perfect opportunity for the parson to hold forth on his knowledge of the pre-European indigenous people of the area, the Mound Builders. The parson pointed toward the horizon and began to tell his guest of the mounds there and the excavations that had recently taken place. The meal came and the parson's suspicions were confirmed when he saw how his new friend devoured the meal. When Betty came by and informed him it was “all you can eat” his eyes literally got bigger. Betty brought another plate. As he consumed this the parson quizzed him a bit more. The young man was heading to Orlando where a friend had promised him he could work in the homeless services program he ran. The pay would be little, but he said he figured with things being so bad economically the best he could do would be to work helping those who were worse off than he. The parson asked the young man to excuse him. He left the building and headed down the slope toward the truck stop, having seen a tractor-trailer enter the lot. He intercepted the driver who was half way to the operator's lounge and greeted his with the affection of two who'd been through a lot over the years. Fred was driving his brand new Kenilworth rig and he looked a bit lonely. And Fred loved to talk. The parson returned to the restaurant where he found his no longer hungry friend finishing his second slice of pie. The young man thanked him profusely. The parson's reward was seeing the satisfaction. They bid Betty good-bye and headed outside. Approaching the car the parson pushed the button on the key that released the trunk lid. As the young man pulled his bag out, Fred walked up. The parson watched them descend the slope and climb up into the cab. In no time they were pulling out. The parson waved and Fred let loose with a blast of his horn. The parson continued to watch the eighteen-wheeler until it turned into the entrance ramp and headed south. He unlocked his door and slipped behind the wheel. But before he started the car he paused to think of the miracle of the young man who lost his job and dropped out to go work in a homeless shelter helping the less fortunate. “Thanks for coming by,” said Lois Weaver as she opened the door to invite the parson in. Lois, a member of the parson's congregation, was about as active as once could be in the work of the church. The doors of the church were seldom open without Lois having unlocked them. Her aging body was beginning to slow her body but not her spirit. She directed the parson to the glassed-in porch running the length of the rear of her ranch style home. The parson eased himself into a rocker where he'd have an unobstructed view of the valley nestled below the ridge on which Lois lived. Lois excused herself and returned to the home's interior, leaving the parson with delightful moments to savor the natural beauty before him and to marvel at the antics of the red-tailed hawk circling at eye level of the parson but hundreds of feed above the valley floor. Momentarily she returned and with the well-bred manners of a Southern belle placed a serving tray holding both a coffee urn and a pitcher of iced tea with a single coffee cup and two glasses containing ice cubes. Lois poured the coffee delicately into the cup and handed it sitting in a saucer. The parson noted the hand painted floral pattern winding about the cup and saucer and vowed to adjust his manners accordingly. Lois poured slowly the tea over the ice cubes of one glass. Task completed, she sat on an ornate white wicker chair, resting her back upright against the over stuffed pillows. After taking a sip of the tea she placed the glass on a coaster atop a wicker side table. Lois asked the parson about some projects ongoing at the church. The discussed ways to expedite some of them. The parson waited patiently for this prelude to conclude and for Lois to get around to whatever was the reason for her invitation to visit. Lois had one son, a successful writer of scholarly works. His primary interest was the indigenous peoples who populated the Southeast prior to the coming of the Europeans. He was a recognized expert on the mound builders of the region. He personally had no interest in the church, but his two children, a boy and a girl, attended from time to time. Usually they came with their Lois, but occasionally they came on their own. The parson knew Lois' son well and the children also. “What's concerning you about the kids?” he asked. The parson smiled inwardly. The conversation was in ways spooky. It had been only a few weeks before when Roger had talked to the parson about his worry over his mother's worry. Lois turned in her chair and looked out over the valley where the hawk still soared on unseen highways of air. As she had turned the parson saw the tears beginning to show in her eyes. It was a private moment. The parson didn't speak. He sat back in the rocker and drank his coffee. When he'd finished and Lois still stared out, he stood and walked to her. When he placed his hand on her shoulder, Lois rose and placed her head on the parson's chest where she quietly wept. Finally, she pushed herself away. My friend Gary spent some time working in the yard of his parsonage recently. That night, tired but contented, he sat down at the kitchen counter to think of something to write in his column for the church newsletter. So that night, thinking of what he had to do and what he’d done that day, he sat at the kitchen counter and wrote two words: “grace” and “pine bark.” From those two buzz words, he knew he’d develop his column when the dawn came. It came. He bathed, shaved, dressed and was ready to meet the day. Down the steps he bounded, heading to the kitchen counter to perk his coffee and to retrieve his buzz words. At first he couldn’t find the piece of paper. It had moved. After a careful perusal of the counter surface he found it, stuck under the corner of his wife's purse. But now in addition to his buzz words “grace” and “pine bark”, there were also words such as “sour cream”, “Jiffy Mix”, “salad fixings”, “milk”, “ground beef”, and so forth. Funny, it seems to me that pine bark, salad fixings, Jiffy Mix, sour cream, and grace truly go together. If grace cannot be found in the everyday things how will we ever experience it? My friend, Gary, another United Methodist pastor, stood at the pump filling his tank with go-juice. It was a pleasant day, not too cold, not too hot. As he pumped his gas a man came up to him. The story was another version of the same one we preachers hear over and over. The fellow had been traveling from one point to another. Somewhere along the way he apparently lost his wallet. Just a little gas was needed to get on down the road, where waited a relative’s house and real assistance. Gary pumped his tank full. The traveler pulled his vehicle up and Gary continued to pump, this time into the vagrant’s tank. Once the second tank filled, Gary invited the man into the store where he bought him a sandwich and drink. They walked back to their cars. One of my laypeople came to me just before church a few Sundays ago. A couple was in the church parking lot. They told the tale of a sick uncle in the southern part of the state. They were on their way from Indiana to his deathbed. (I took note of their Tennessee tag.) But they’d miscalculated how much gas it would take to get there. I talked to them a couple of minutes. The church service was beginning. I didn’t have time for this. I sent for my wife and asked her to drive to the service station and fill their vehicle up with gas. After the service, my wife informed me we’d just put more than $50 on our stretched credit card. And she mentioned that after their tank was filled, they had pulled over to a parking space on the side of the store and were still sitting there when my wife left. I told her they were probably waiting for her to leave when they’d go into the store and stock up on whatever they wanted. The next Sunday I told the story to my congregation. In doing so I confessed that I didn’t believe for a minute those folks needed any gas. But, I told them, I also believed that God had sent them to our church – we’re six miles off the interstate. I told them for whatever reason we’d been chosen to be the instruments of God’s grace. Today, I’ve been working on the bills. Here I am, a tired old United Methodist parson, trying to save some money to get to California in May to see my niece graduate. I could use that $50 now. You know, it’s just damn expensive to be the instrument of God’s grace.